Gather ingredients and preheat oven to 400°F. Spray a baking dish with nonstick spray. 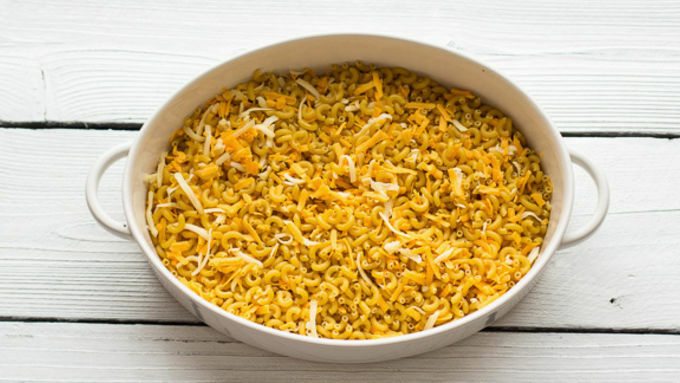 Add the pasta and about 1 cup of cheddar cheese to the prepared baking dish, set aside. Melt 4 tablespoons butter in a large saucepan over medium-high heat. Add flour, whisking constantly, for about 2 minutes. 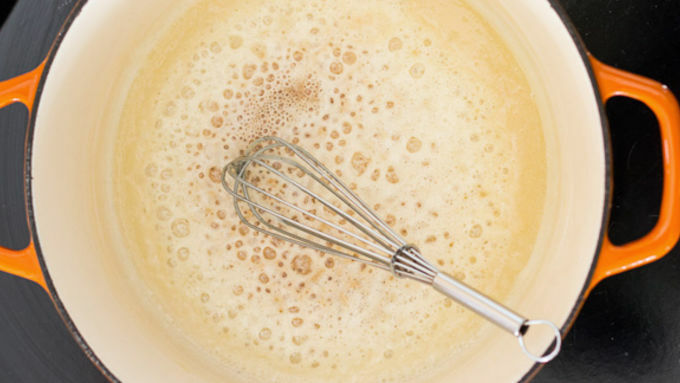 Whisk in milk and 1 1/2 cups water. Bring to a boil, reduce heat to a simmer, and cook, whisking often, until a very thin, glossy sauce forms, about 10 minutes. Stir in the mustard powder, cayenne pepper (if using), salt and pepper. Remove the sauce from the heat. Stir in the remaining 2 1/2 cups of cheddar cheese until smooth. Pour the sauce over the pasta, stirring to coat. The pasta should be submerged in the sauce. Cover with foil and bake until pasta is almost tender, about 25 minutes. Meanwhile, wipe your same sauce pot clean, then add remaining 4 tablespoons melted butter. 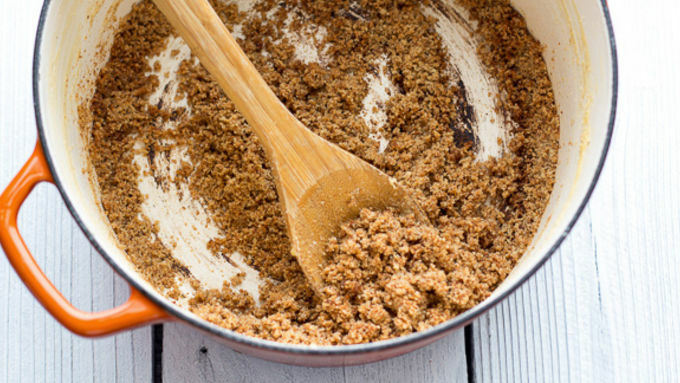 Add garlic and breadcrumbs, toss to combine. Season with salt and pepper. If desired you can toast the crumbs over medium heat for 4-5 minutes until fragrant. Remove the pasta from the oven and remove the foil from dish. 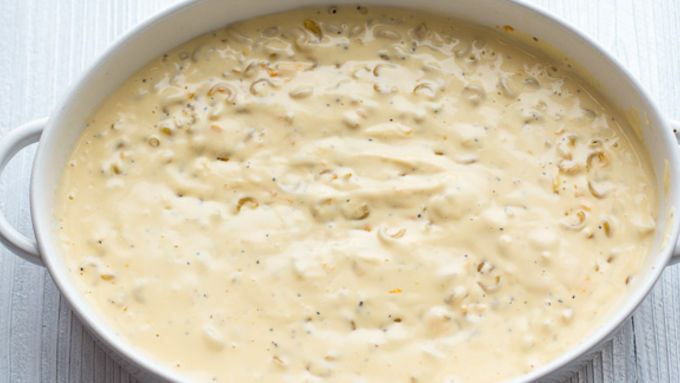 Sprinkle with remaining 1/2 cup havarti cheese, then the breadcrumb mixture. Bake until pasta is tender, edges are bubbling, and top is golden brown, about 10-20 minutes longer. Let sit 10 minutes before serving. Garnish with parsley if desired. 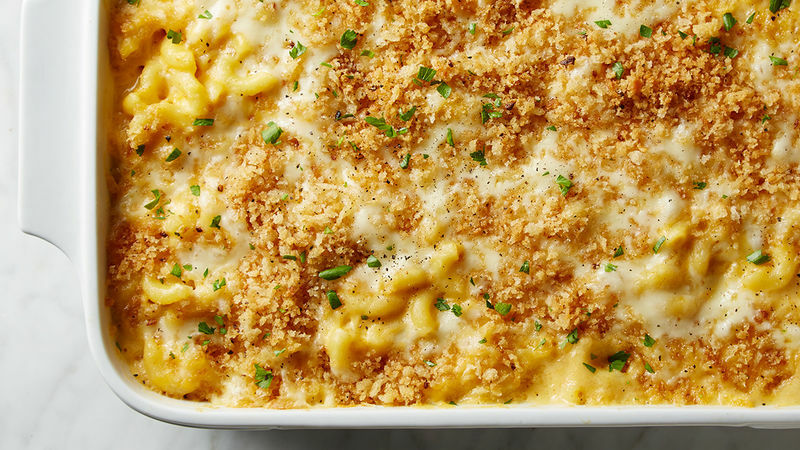 I don’t know about you guys, but Mac and Cheese is a necessity in my house. 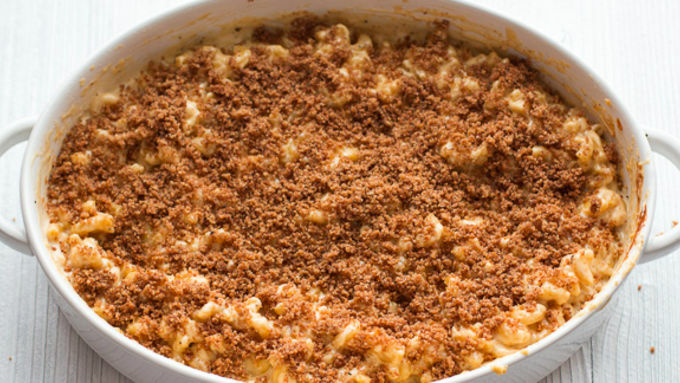 Now that it is officially winter, my family’s Mac and cheese cravings are out of control. I know that some people say nothing can ever beat the boxed stuff, but to be honest, I found a way that's just as easy! When I heard the concept of not boiling your pasta before baking, I kind of thought it would never workj. But then I tried it and it totally worked. 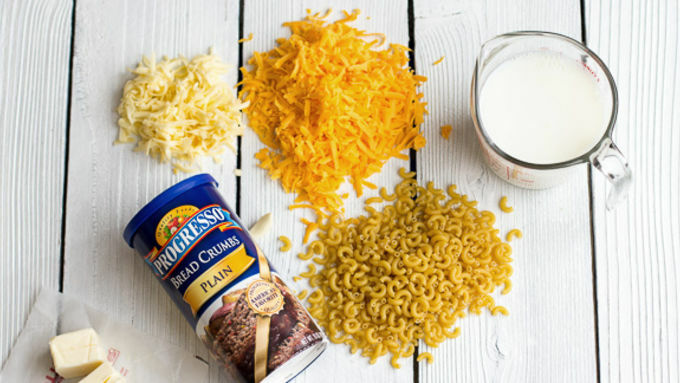 I was amazed, and it’s great because it creates one less dish, one less step and more time for other daily things (like sitting by the warm fire!). Holy heck yes!! Plus, I mean life is busy for most of us – this is the perfect dinner to get back into the swing of things after the holidays! This is optional, but toasting the crumbs on the stove for 3-4 minutes was definitely worth the minor effort. The bread crumbs add a really nice texture. Sit back and take in the gorgeousness… And devour!